The Road to Mississippi quilt block is an easy block to make and, for many, it can be an introduction to the square in a square quilt patch. This patch is quite common but can pose some difficulty in the mathematics to cut just the right size of square. However, you should enjoy this patch as it is nice to deviate from the more commonly used patches, such as the half square triangles and flying geese units. A quick side note is that there are half square triangles present -- those triangles used to create the 'square in a square' units. 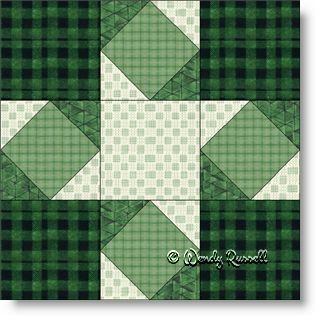 This quilt block is constructed as a basic nine patch block, which is the most commonly used quilt block. The sample quilts illustrated show you just how very different you can create your heirloom quilt from another's. Enjoy!